Recent Xbox 360 updates have allowed the system to spit out resolutions up to 1080p, and with the new HD DVD add-on drive there's more reason than ever to use a high quality VGA signal instead of the more standard 3-cable component. However there's a bit of a catch -- VGA cables for the 360 cost about $40. According to my calculations, that's about 2 pizzas and a case of beer less to game with. WE don't know about you, but we find that a pretty scary proposition -- yours buddies that swing over for game night probably do too. 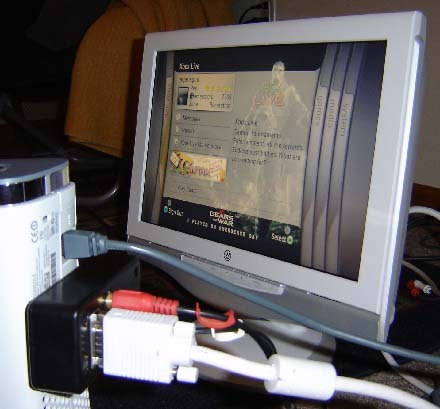 In this How-To we'll describe how you can turn your existing Xbox 360 video cable into a "multi-out" device capable of VGA. You don't even need to hack inside the Xbox itself, just the cable. Total cost is around $7, including the Radio Shack project box shown above. Ready to save some cash? Let's get in there! The following mod allows you to use a standard Xbox 360 cable to create a special VGA cable that would normally be purchased separately. The reason we can hack the standard cable in this way is because Microsoft was kind enough to put every pin in the normal connector, even ones the cable doesn't use. Standard plugs on other systems (notably the PS2 and Gamecube) only have the pins the plug needs. Small pair of tweezers (very useful). Metal cutting pliers, tin snips, something along those lines. Soldering iron. A lighter powered, 15 watt range one is best. Solder... WITH lead works best. 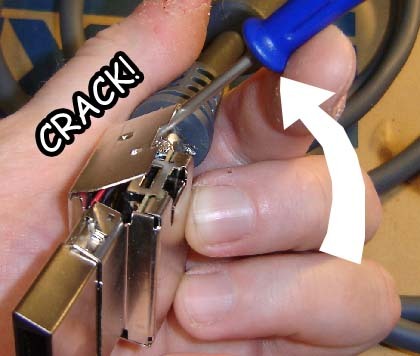 We know that sounds awful but it'll help you "convert" the lead-free solder inside the Xbox connector and make it much easier to work with. Multimeter, with circuit testing option. The kind where if you touch the two probes it beeps to indicate a connection. Hot glue. Oh yeah, that's right! Don't leave home without it. Small, thin flat-bladed screwdrivers, a larger flat-bladed screwdriver. 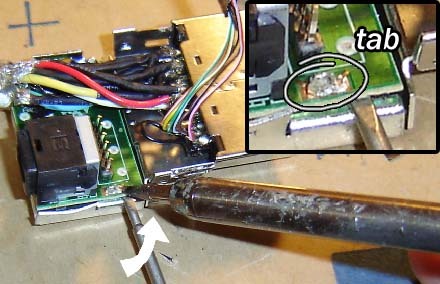 Desoldering iron (optional, see instructions). Alright let's get going on this sucker. Insert a small, thin screwdriver at the seam shown in the above photo. Press in and towards the label (also as shown) to get around the inner lip. Once you breach the lip you should hear a crack. You're in! Make a few more breaches like this next to each other, then insert a larger screwdriver as shown below. Twist it and the casing should pop open nicely. Next, insert the big screwdriver at the seam near the main cable, and twist the case open at this place as well. You can now pull off the bottom portion of the plastic, and then pull the guts out of the top portion. The "TV / HDTV" switch will fall out at this point, save it if you ever plan to revert the cable to its original form (which is becoming less and less likely as this progresses). 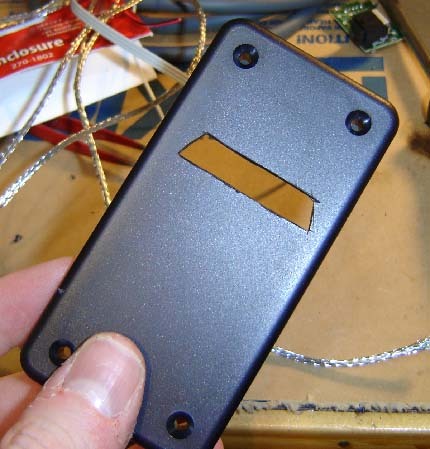 Use your small screwdriver to pry up the metal near the TV/HDTV switch, as shown below. 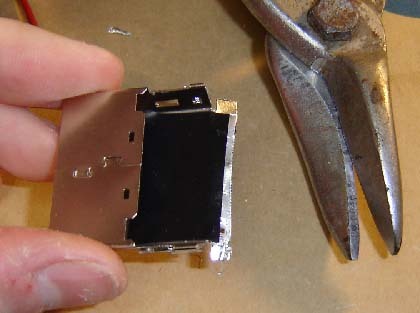 Now pry the metal up and right off the optical audio jack, and bend it down on the right side, as shown below. You can now pull the main piece of shielding metal up away from the rest of the jack. 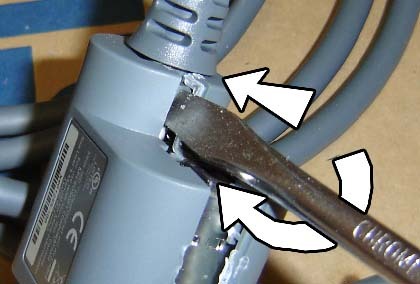 Snip the shielding free of the main cable using your metal cutters. Now you should come across a piece of material that looks amazingly like electrical tape. (Don't worry, we're sure it's certified next-generation electrical tape.) Remove it and the jack should now look like the below photo. On the left you can see the little circuit board containing the optical audio port and TV/HDTV switch, on the right is the connector itself with all the wires going to it. Next we need to remove the circuit board from the metal. It is held down by 3 tabs. 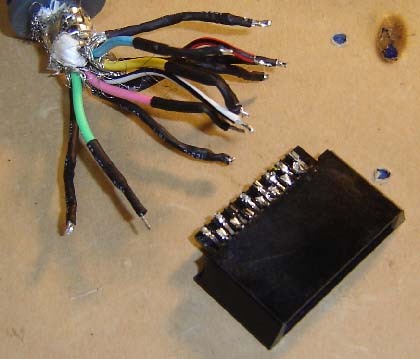 You can desolder the tabs with a desoldering iron, or wedge your small screwdriver under the board and pry up as you heat the tabs with the regular iron. Since everything on the Xbox 360 uses that lead-free solder, it might help to mix some fresh (ahem leaden) solder onto joints to help them melt. 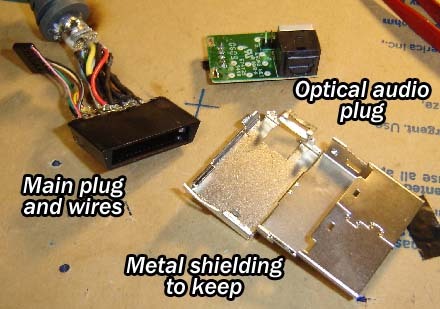 Once you get to the side with 2 tabs (near the TV / HDTV switch) you'll need to snip the metal shielding free of the cables before you pry up the PCB. 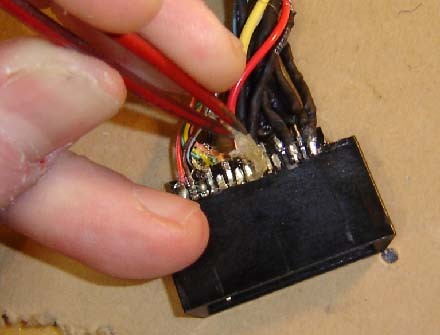 Once the circuit board has been desoldered from the tabs you can unplug the little connector on it and pull it from the main assembly. Finally, take your thin screwdriver and stick it between the black plastic and the thin top shielding as shown below. (Sorry the photo's a bit blurry, bigfoot musta been nearby.) Pry the metal up a little and you'll be able to pull the black plug out from the shielding. Be sure to save this piece of shielding for later. The plug pieces should now look like the following. Before we start making the wiring connections you'll need to carefully remove the glue stuff covering the pins, as shown below. Use your tweezers and be sure not to pull the blank pins up with the gunk. If they do bend up, simply push them back down. The glue is pretty easy to remove. With the glue removed you can remove all the wires from the plug. 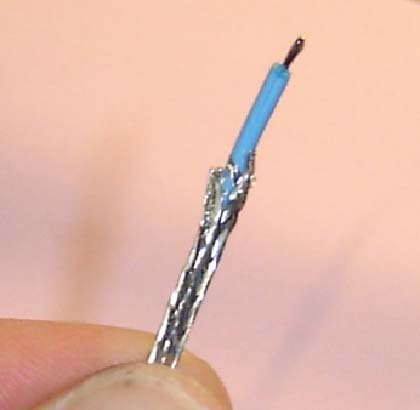 Simply heat up the solder on each wire until it easily pulls free. At this time you should put a small bit of fresh, new solder on each of the pins. This will make attaching new wires much easier. Shown below is the end view of the now wireless plug and a drawing of which pins we'll be using for this VGA mod. Keep in mind this pinout refers to the WIRE end of the plug, looking at it from behind as it would go into the console. The numbering might look a bit weird but it refers to how the connections are labeled on the 360's motherboard. 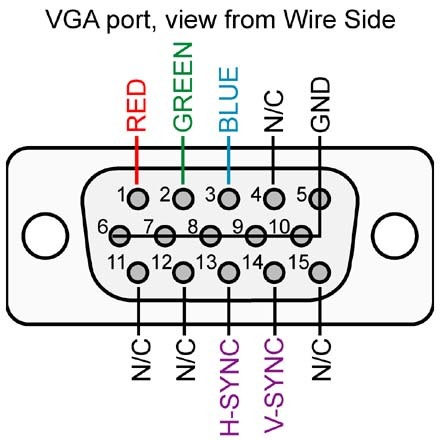 Before we go any further, here's the wire-end view pinout of a VGA port. Pins that we don't need for this project are simply called N/C (no connection). 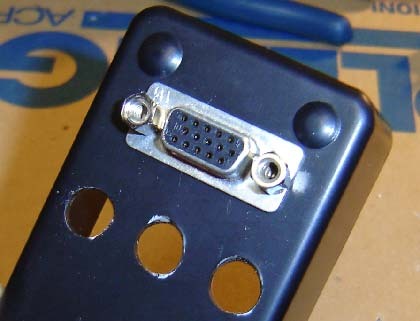 Most VGA-type ports also have the pin numbers etched into the plastic for your added reference. Download a large PDF version of these pinouts, suitable for framing. Breakout box type adapter. As shown at the beginning of this article. Requires buying a few parts (the aforementioned seven bucks worth) but is more useful in the long run. Single cable coming off the Xbox. For this you can use an old VGA cable. 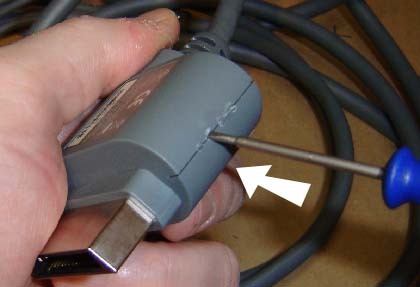 Slice off the computer end of the plug so you can connect the wires directly to the Xbox 360 video connector. You'll also need some left and right audio cables, plus a yellow cable if you'd still like the option of using composite video. 2 position selector switch (if you want the cable to switch modes). 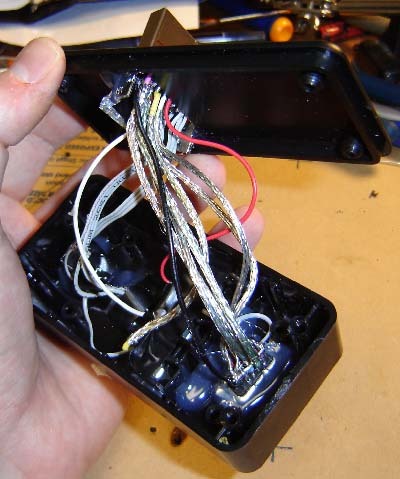 You can use the Radio Shack Catalog #275-409, or just desolder the switch from inside the Xbox component cable. Left and right RCA phono plug audio cables, such as those from a stereo system. You'll need these since the VGA plug doesn't carry audio. If you plan to just use the optical audio, we'll describe how to wire it in the breakout box section. Yellow composite (crap) video RCA phono plug cable. You'll only need this if you want the cable to switch modes. A great source for both this and the audio cables are old PS1, N64 or GameCube cables. Cut off the computer end of the VGA cable if you haven't already. Strip the main coating off to reveal the wires inside. The main connections you'll need are red, green, blue, horizontal sync and vertical sync. They may or may not be color coded. H and V sync may be a shade of white. Put a little solder on each wire to keep the strands together. This will also help when attaching it to the Xbox connector. All the shielding around the wires you find inside the cable is ground. Also note that a lot of the pins on the VGA connector are ground. Solder the wires from the VGA cable to the Xbox 360 connector using the pinouts provided to match up the signals. You can connect all the VGA ground shielding to a single ground spot on the Xbox connector to make it easier on yourself. Strip the ends of the audio cables to reveal the inner wires and copper shielding. Attach the inner wires to the left and right audio spots on the Xbox connector (pins 16 and 15) and the outer shielding to any ground. 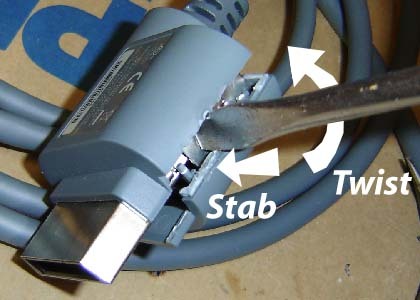 If you're attaching a composite video option, strip and attach the composite (yellow) video cable in the same way to pin 7 of the Xbox connector. The selector switch (either the Radio Shack model or the one from the connector itself) has 3 leads on it. Connect the center lead to ground and the side leads to pins 20 and 24 on the Xbox connector. The switch can now "ground out" one of those two connections to set the video mode. Pulling pin 20 to ground sets the Xbox to VGA mode, putting 24 to ground sets it to composite. You can now insert the black plastic Xbox connector back into the metal shielding we removed earlier and plug everything in to see if it works. (See "Setting the Xbox to VGA", below.) If you have a problem, check out the Troubleshooting section at the end of the article. Breakout Box. I used Radio Shack Catalog # 270-1802 cause it was the smallest and cheapest. 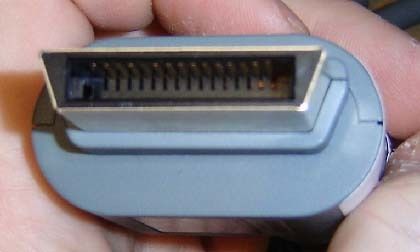 D-sub 15 female connector (VGA port). Radio Shack Catalog #: 276-1502, Digi-Key: T815FE-ND Mouser: 523-G17S1510110EU If you have an old PC video card you can desolder one off that if you wish. But a new one is pretty cheap and easy to use. 2 position selector switch, if you want the box to switch modes. 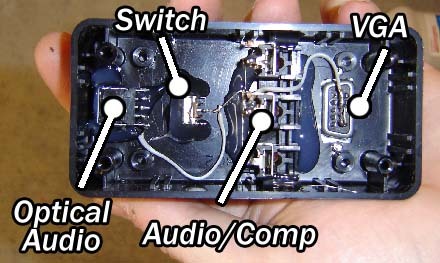 You can use the Radio Shack Catalog #275-409 or just desolder the switch from inside the Xbox component cable. 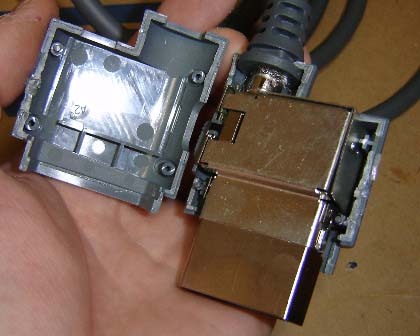 3 RCA phono jacks, for the audio and composite video. This is the type found on the back of DVD players. Radio Shack Catalog #274-346, Digi-Key: CP-1413-ND (red) CP-1414-ND (white) CP-1415-ND (yellow) Mouser: 161-4319-E. As with the VGA port you may have some old electronics you can pull these off. Shielded wires from inside the Xbox video cable. Some standard thin wire. Old floppy/IDE drive cable works great and is, best of all, free. Free is great -- it saves you money for things that aren't. Like beef jerky. Standoff screws from a PC. These are the type with a "screw within a screw" that are often used under the motherboard. Some drill bits. Sizes of 1/8th, 3/8th, and 1/4th-inch will be helpful. 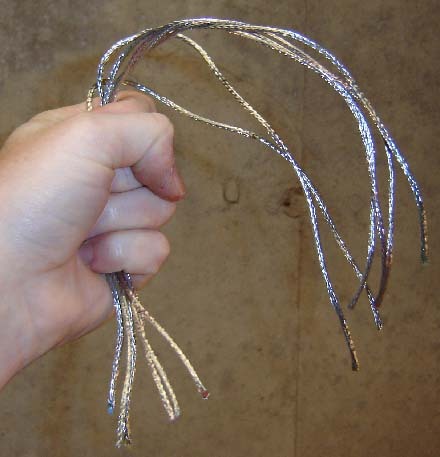 The shielded wires from the Xbox 360 cable, or as I call them "Buck Rogers Spaghetti." These will work great for the inside wiring of the breakout box. Cut each wire to about 6-inches long for now, we can trim them shorter later as needed. You'll need 8 of them. Start by sliding off some of the shielding and stripping the end of the inner wire. Dab a bit of solder onto it to lock all the strands together - this is called "tinning" and will make soldering it to the connector much easier. You can also put a little solder at the end of the shielding to keep it from fraying apart. Solder a shielded wire to each of the following pins on the Xbox connector, or a regular thin wire as noted. Attaching them in the order specified works best, or reverse if you're left handed. 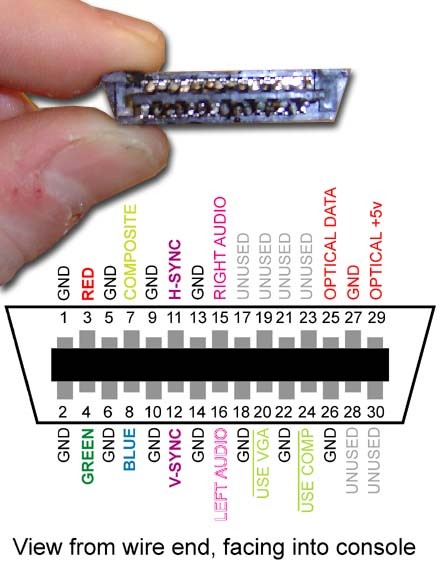 Optical audio data (pin 25) -- use a regular thin wire for this. Now you can slide the black Xbox connector inside the metal shielding. Be sure there's a layer of electric tape inside in case any connections hit the metal shell. With the wires soldered to the connector we can get the breakout box itself ready. Set the connector against the lid of the box and trace the outline of it with your knife. About 1/4 of the way from the side is best, as shown below. Cut out the hole using either a Dremel or by making several deep cuts with an X-Acto knife and then "popping" the shape out by pressing on it with a screwdriver. The lid of the project box with the trapezoid connector hole. Stick the connector through the hole and see how it fits. Adjust the hole as needed. 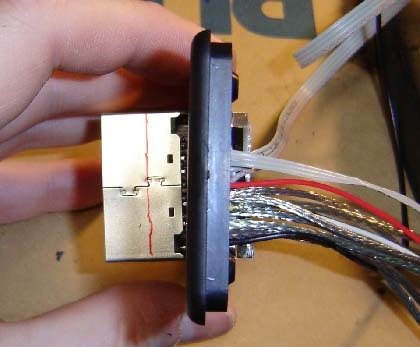 Test this rig by plugging into the Xbox 360 and adjusting the tilt of the lid to the curve of the Xbox, as shown. Once it fits fully into the Xbox 360, put some hot glue (yes!) 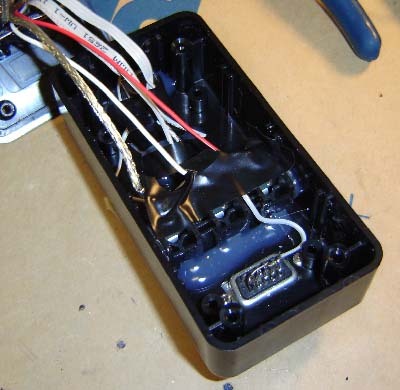 on the inside of the lid to temporarily secure the connector in place. (Don't worry about the hot glue, your 360 is fully accustomed to heat.) Once it's cool and secure, remove the whole shebang from the XBox. On the bottom of the main portion of the box carve and cut a hole for the VGA port. Once the hole's big enough stick in the port and drill 1/8th" holes in the plastic to match its mounts. Then you can screw in some standard PC motherboard-style screws to hold down the VGA port, just like on a computer. For added security screw on somes nuts on the inside (or just dump in a bunch of hot glue if there's no room for that). Drill (3) 3/8th-inch holes for the audio and video RCA ports. Space them evenly. Be sure to keep these ports on the side of the box away from the Xbox 360 connector. That way you know they'll be enough room inside. Desolder the optical audio port from the small circuit board from the connector. It may help to "freshen up" the solder first before you try to remove it. Make a square hole for the port on the opposite side of the box from the VGA port. This can be done by drilling a 1/4th-inch hole and then carving corners from it. Insert the optical port as shown below. The pinouts of the 3 center pins are also provided for when you attach it to the main connector. 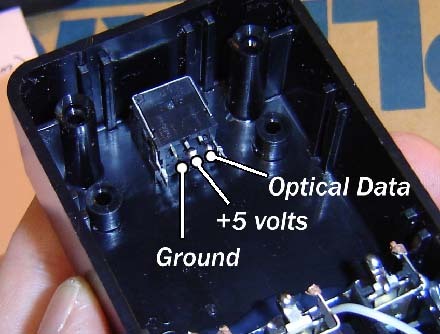 The two side tabs of the optical port don't need to be connected. 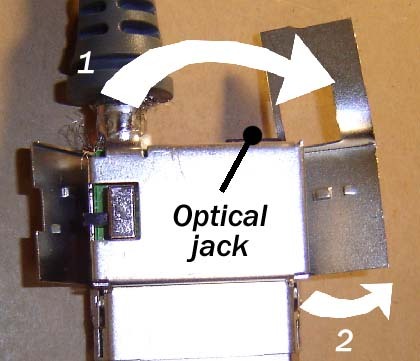 Secure the optical port using... get this... hot glue! Hey, it works. The business end of the optical audio port. We actually think it's called a TOSlink but optical audio port sounds more... um, universal. TOSlink sounds like some dude from Lord of the Rings. Drill a hole between the optical port and the audio ports that will fit the shaft of the selector switch. A 3/8th-inch hole will work for the Radio Shack switches mentioned above, or a slightly smaller one if you're using the switch from inside the connector itself. Install the switch using yet more hot glue. Of course be careful not to cover the 3 pins of the switch. Even though it'll be near the Xbox connector this switch isn't big enough to cause a space problem. The inside of the breakout box should now look like this, give or take 5 pounds of hot glue. As you can see I've wired the grounds of all the ports together. 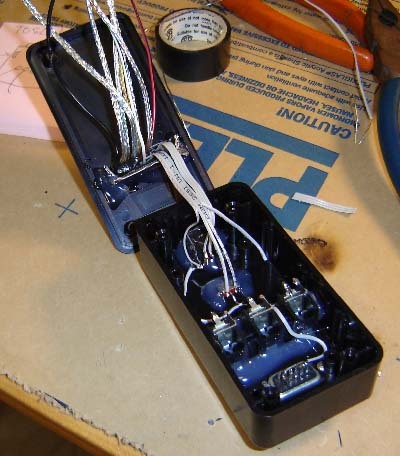 Place the pieces of the box together as shown and begin by wiring up the optical port. Cut the wires as short as you can so it's easy to stuff everything in the box. Connect ground to the center pin of the three pin selector switch, pin 20 of the Xbox connector to one side, and then pin 24 to the other. This allows the switch to select between VGA and composite modes. Connect audio (pins 15 and 16) and composite video (pin 7) to the middle pins of the RCA ports next. 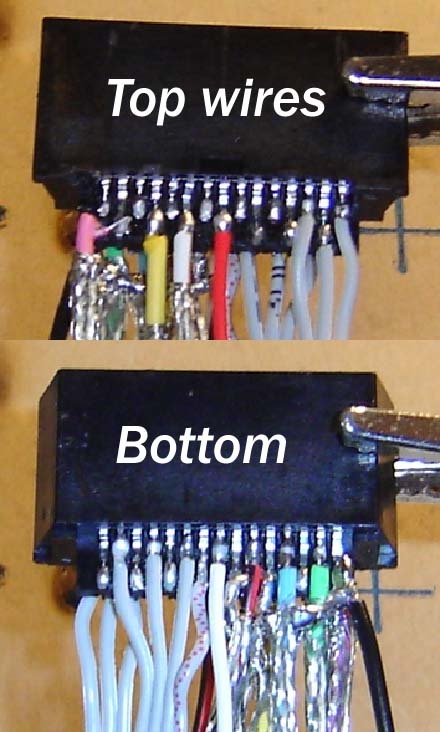 The outer rings of the RCA ports should all connect to ground. 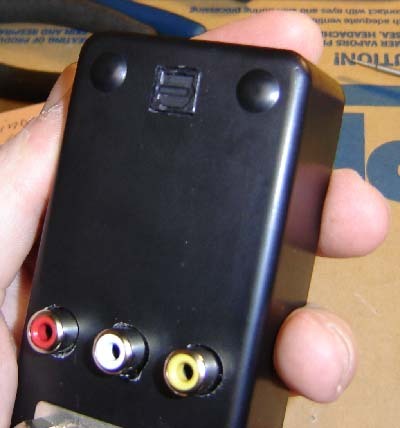 After wiring the RCA ports cover the connections with electric tape. This keeps them from shorting out on all the shielding around the main VGA wires. Speaking of that, connect the 5 VGA wires next. Red, green, blue, H-Sync and V-Sync. Check the above VGA port pinout for reference. You can now close up the box. Smush the halves together, arranging the wires as you go to make sure everything will fit. Screw the case shut -- you're done! 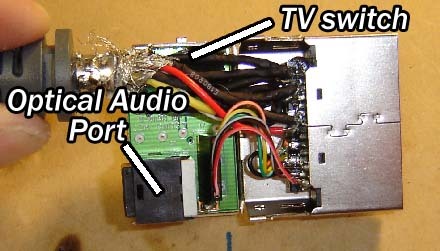 Ok, plug in the breakout box, or cable, or whatever you ended up making, to your monitor / VGA-enabled TV and Xbox. Switch all your stuff on. You should see the Xbox boot up (it might take a hair longer than usual). If not, skip ahead to Troubleshooting. Once you're in, go to Dashboard, then goto the System blade and hit "Console Settings", and "Display"
You can now select a resolution and aspect ratio to fit your screen. The 360 works best with widescreen displays although you can still make it work with square monitors as well. Strangely enough it'll letterbox the game whilst the dashboard and message panels will take up the whole screen. Weird, huh? Boot up Gears of War or some other awesome looking game and drool 50% more than usual. Just think -- now you might be able to read the text in Dead Rising. Oh noes! You followed all the instructions but something isn't quite right - is it any of the following by chance? 4 red lights (but not of death). Since we've all heard of the dreaded "3 lights of death" a whopping FOUR lights could cause instant heart failure. But don't worry, it's actually just a "Video Cable Missing" warning. Check that the Pin 20 and 24 connections are correct. If neither of them are switched to ground the Xbox doesn't know what video mode to use and assumes there's no cable at all. Inversed, Andy Warhol-esque colors. Suddendly the Dead or Alive girls all have blue skin... Anime? A strange STD? Nope, you just got your some of your RGB wires mixed up. Now we bet you're glad you didn't slather all the connections in hot glue yet - right? Ghosting. If you see some ghosting of images on the screen you probably have insufficient shielding. Make sure all the shielding is connected to a ground someplace. If you use a decent VGA cable this really shouldn't be a problem, unless you live in the Bermuda Triangle or something. Optical audio problems. Be sure you have the ground, +5v and data pins wired to the connector correctly. Is the Xbox set to output this type of signal? Alright well sorry if this how-to seemed a bit long, we just wanted to make sure you knew exactly what to do. Enjoy your sparkling new, crisp, hi-def, life-like (insert your own superlative here) video!